NOTE: This test should be done with original equipment tires and wheels at the correct tire pressure. 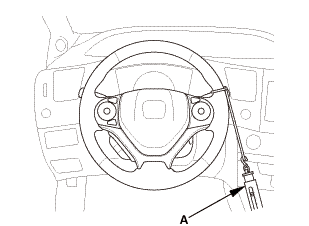 Attach a commercially available spring scale (A) to the steering wheel. With the engine idling and the vehicle on a clean, dry floor, pull the scale as shown, and read it as soon as the tires begin to turn.